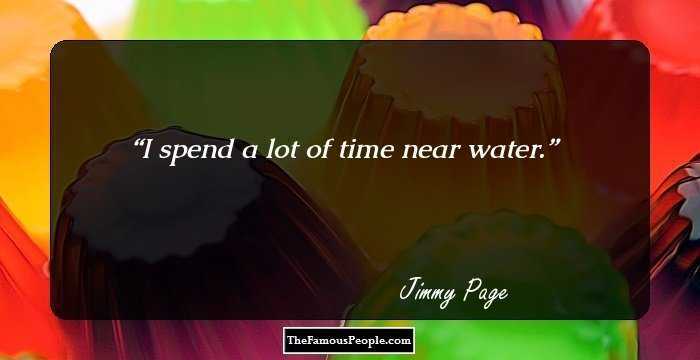 Inspirational quotes and sayings by Jimmy Page on music, singing, love, writing, challenges, and Led Zeppelin. In the gigantic world of rock music, Jimmy Page’s status as a musical stalwart stands tall. Page made a name for himself owing to his strong bohemian, yet intellectual personality. There is plenty of inspiration one can take from Page’s life: he is self-taught and managed to lead a groundbreaking rock band for several years. Despite being immensely successful, he remains humble and is still rooted is his music. Today, he is a rock hero who continues to inspire many and aspire devoted fans who eagerly read his interviews and attend his performances. We have assembled a collection of Page’s quotes from his interviews in the media, articles, books written about him, and his autobiography. 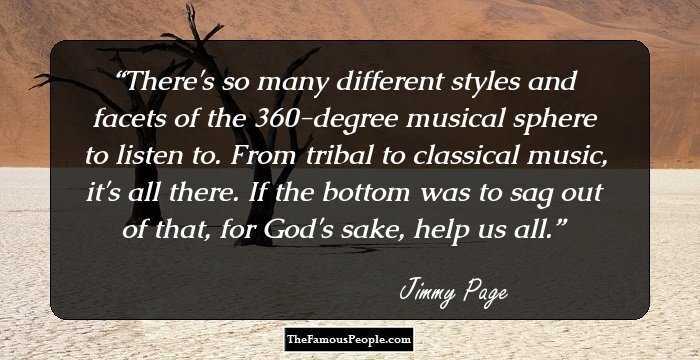 Here is a look at Page’s encouraging and inspiring quotes on music, singing, love, writing, challenges, and Led Zeppelin. 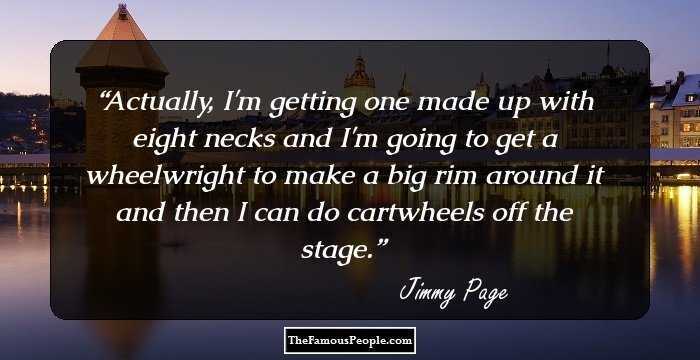 Actually, I'm getting one made up with eight necks and I'm going to get a wheelwright to make a big rim around it and then I can do cartwheels off the stage. 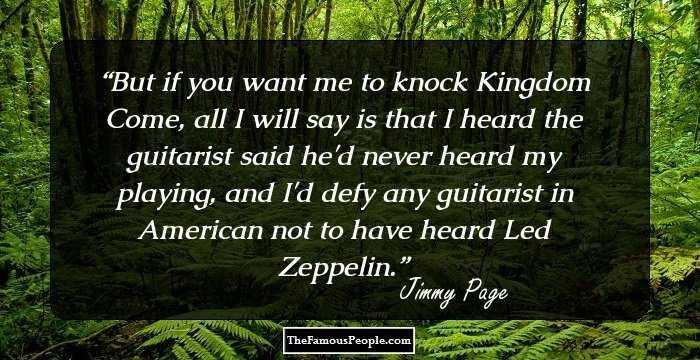 But if you want me to knock Kingdom Come, all I will say is that I heard the guitarist said he'd never heard my playing, and I'd defy any guitarist in American not to have heard Led Zeppelin. I spend a lot of time near water. Seeing people's faces, really getting off on them, makes me incredibly happy. Genuinely. There's so many different styles and facets of the 360-degree musical sphere to listen to. From tribal to classical music, it's all there. If the bottom was to sag out of that, for God's sake, help us all. I don't feel I have to top myself at all. I don't like being stuck in one situation, day to day. I know what I want to get down and I haven't got much time to do it in. You can't buy time. 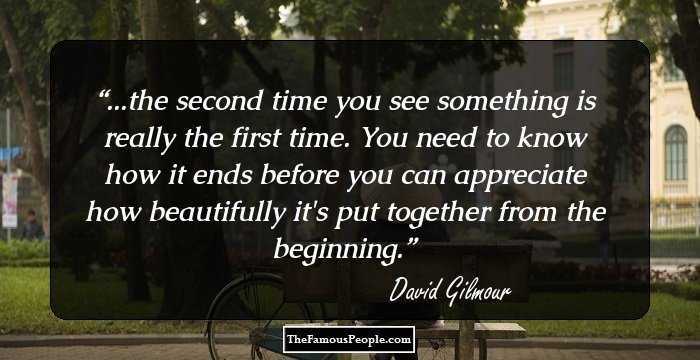 Everything, for me, seems to be a race against time. Especially musically. You know what you can gain when you sit down with the Moroccans. As a person and as a musician. That's how you grow. The key to Zeppelin's longevity has been change. I will still carry on changing all the time. 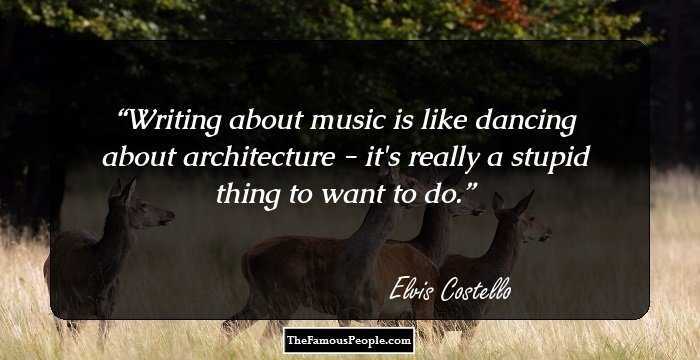 You get as much out of rock & roll artistically as you put into it. There's nobody who can teach you. You're on your own and that's what I find so fascinating about it. When I started doing sessions, the guitar was in vogue. I was playing solos every day. It's interesting when something new comes along, a band of dwarfs playing electronic harps or something, but I'm not searching. Everything that came later... the roots are all there in the first album. The beauty of the band was you never knew what was going to come out next. The element of change has been the thing, really. We put out the first one, then the second... then a third LP totally different from them. 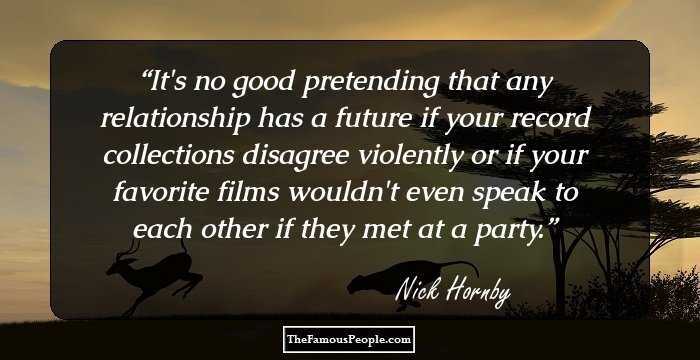 It's the reason we were able to keep it together. I suggested back in 1980 to do a chronological live album, but there wasn't that much enthusiasm for it. Live Aid did feel like one hour's rehearsal after several years, but to be part of Live Aid was wonderful. It reall was. There's always music that moves me. It doesn't necessarily mean that it's within the parenthesis of rock or blues, or whatever. It's usually far more reaching than that. 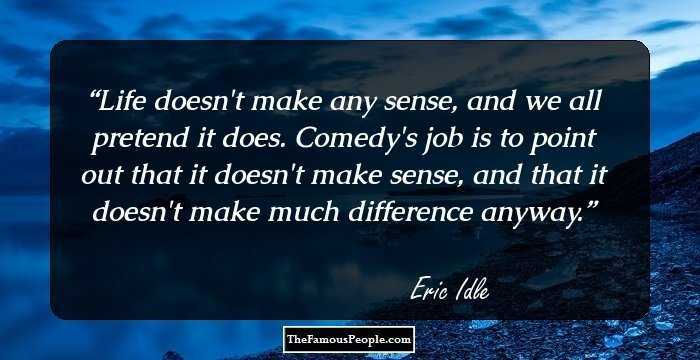 It can be in many different genres. There's too many good musicians around for the music around for the business to be sagging. 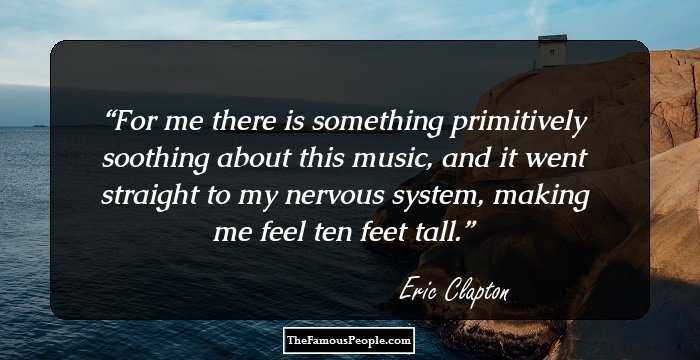 When you hear the melodic structures of what classical musicians put together and you compare it to that of a rock & roll record, there's a hell of a long way rock & roll has to go. The idea of a hypnotic riff as the prime mover of a piece of music has been around for a long time, whether you're talking about the Delta blues or music from Middle Eastern and African cultures. You don't find geniuses in street musicians, but that doesn't mean to say you can't be really good. I can only listen to what I'm working on, at the time. I can't listen to anything else because I don't want to copy it. There's such a wealth of arts and styles within the guitar... flamenco, jazz, rock, blues... you name it, it's there. In the early days my dream was to fuse all those styles. Now composing has become just as important. I think it's time to travel, start gathering some real right-in-there experiences with street musicians around the world. All my houses are isolated. Many is the time I just stay home alone. I'm attracted by the unknown, but I take precautions. I can listen to all different sorts of music. I don't really care about The Next Big Thing. You can't just find yourself doing something and not happy doing it. I like change and I like contrast. A lot of people can't be on their own. They get frightened. Isolation doesn't bother me at all. It gives me a sense of security. I can tell how far I ought to be going, I know how to get there, all I've got to do is keep playing. I don't go walking into things blind. I'm very fortunate because I love what I'm doing. I'm over 30 now, but I didn't expect to be here. There are very few people I can call real, close friends. They're very, very precious to me. I don't care what critics and other people think. No. I usually rest in my satin-lined coffin, actually. I'm not allowed out in daylight hours. Just because you play bass, doesn't mean you have no presence. I do not worship the devil. But magic does intrigue me. Magic of all kinds. I bought Crowley's house to go up and write in. The thing is, I just never get up that way. Friends live there now. There's music that can affect people in their lives, and they will always relate to the point that they heard it and experienced it, either if you're playing it or you're receptive, as an audience. I'm pretty optimistic about the future of rock... it will be back to composition as in classical music or jazz. I really wasn't needed... Just straightening up riffs, that's all. Just two guitarists doing it instead of one. From the classical guitar right through to the furthest electrical experiments and everything in-between, it's amazing what the guitar can actually do. I mean, when one thinks about sounds. My guitar style was developed during that 10-year period. That's me. That's the way I play, and I don't wish to play any other way. Our own individual identities are firmly stamped on this album. I really don't like showing people how I play things; it's a little embarrassing because it always looks so simple to me. I guess the solo from 'Achilles Last Stand' is in the same tradition as the solo from 'Stairway to Heaven'...it is on that level to me. I played guitar all my life, all the way through the Yardbirds, but I knew that for me this was going to be a guitar vehicle, because that's what I wanted it to be. Every record is a portrait of the band at that time. The blues appealed to me, but so did rock. The early rockabilly guitarists like Cliff Gallup and Scotty Moore were just as important to me as the blues guitarists. The way I see it, rock & roll is folk music. Street music. It isn't taught in school. It has to be picked up. I deal in emotions. 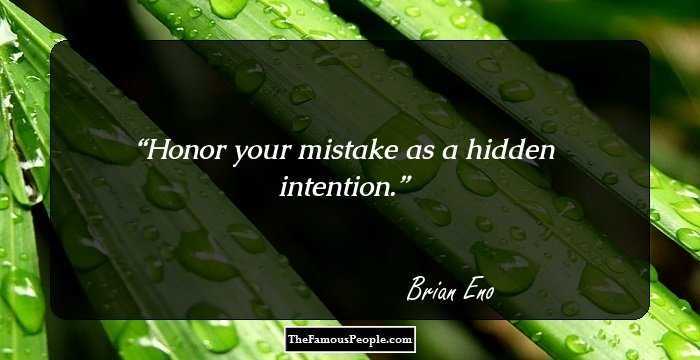 It's the harmonic side that's important. That's the side I expected to be much further along on than I am now. That just means to say that I've got to keep at it. I don't know whether I'll reach 40. I don't know whether I'll reach 35. I can't be sure about that. I am bloody serious. I am very, very serious. I didn't think I'd make 30. I do really believe that all guitarists have a different character that comes through, that's a strong character, the stronger the person is. I know where I'm going musically. I can see my pattern and I'm going much slower than I thought I'd be going. My finger picking is sort of a cross between Pete Seeger, Earl Scruggs, and total incompetence. I bet you can't play slide piano. Domesticity and all that isn't really for me. I'm not a guitarist as far as a technician goes, I just pick it up and play it. Technique doesn't come into it. When I went over to the States to promote Outrider, everyone was telling me I was a blues guitarist. I'm not a bloody blues guitarist. I'm a guitarist. I've never regretted anything I've ever done. So far I've been very, very fortunate because it appears that people like to hear the music I like to play. What more fortunate position can a musician be in? Music can always be a life-changing experience, for musicians and fans, or at least life-affecting, but it depends on to what degree. This week, I'm a gypsy. Maybe next week it'll be glitter rock. I'm not interested in turning anybody on to anybody that I'm turned on to... if people want to find things, they find them themselves. I'm at my best when I'm exhausted and under pressure. There's so much that can be done on the guitar. And that's what is so good about the guitar - everyone can really enjoy themselves on it and have a good time, which is what it's all about. I'm still terrified of flying. I really have to get drunk to fly. I've found that I've developed fears I never had before... fears of heights, claustrophobia... only in cities, though, never in the country. Once I get onstage the tension explodes and I'm fine. I'm in another world - in a trance almost, doing what I love best, expressing myself through guitar. If you are on to something creative, school can also inhibit you. The wrong teacher, man, can really mess you up. You absorb so much from whatever your environment is, as an artist, and you learn to take from it what can help you create. I'm still searching for an angel with a broken wing. It's not very easy to find them these days. Crowley didn't have a very high opinion of women, and I don't think he was wrong. The greatest satisfaction is not the decoration. It is knowing that I am able to help someone who needs help. I'm not afraid of death. That is the greatest mystery of all. That'll be it, that one. But it is all a race against time. I have a voracious appetite for all things, worldly and unworldly. My favorite guitar solo of all time was Elliot Randall's on `Reelin' In The Years'. You can't overthink the music. Mood and intensity can't be manufactured. The blues isn't about structure; it's what you bring to it. The spontaneity of capturing a speciﬁc moment is what drives it. I don't deal in technique. I deal in emotions. 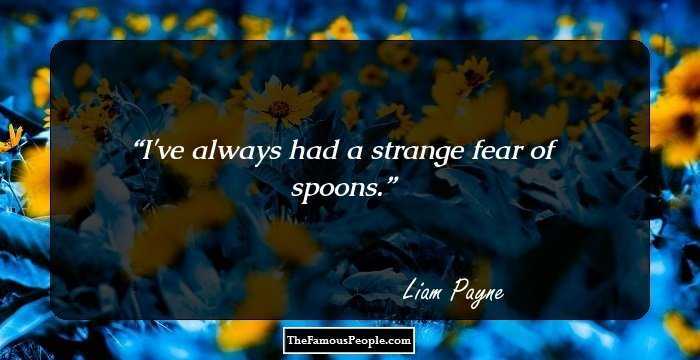 So many people are frightened to take a chance in life and there's so many chances you have to take. I can communicate far better on a guitar than I can through my mouth. Music is the one thing that has been consistently there for me. It hasn’t let me down. I wasn't a very good draughtsman. Here's where it goes with Led Zeppelin. 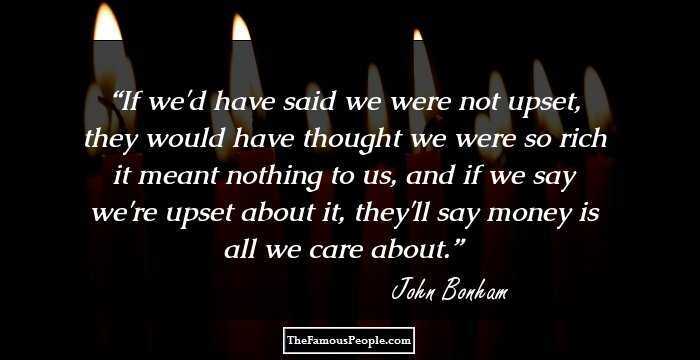 It didn't matter what was going on around us, because the character of Led Zeppelin's music was so strong. I was always good at hearing complete arrangements in my head. I was excited about opening for Vanilla Fudge because I was a big fan of theirs. Spirit is a band I really love. I really love playing live - it's such a gas. Every album that I've attempted, I suppose, has been different - it's bound to be. The thing about Led Zeppelin was that it was always four musicians at the top of their game, but they could play like a band. 'Communication Breakdown' - it was punchy and direct, with a real attitude that was different to other bands going around. There is no point in putting out 'The Complete BBC Sessions,' and someone's growling that you missed something. John Peel made his reputation with his radio show and his record label, Dandelion, by championing the underdog. I can understand why we got bad reviews. We went right over people's heads. One album would follow another and would have nothing to do with what we'd done before. People didn't know what was going on.